My son Dan returned to Denver after spending nearly five months in Asia, and he wanted to spend a day fishing before heading off to Durham, NC for graduate school in the Fuqua MBA program. We settled on Thursday as the best day to fit in a day of fishing. Dan had plans for most evenings, so we didn’t want to make a long trip that required two or more hours of drive time, so I researched the closer stream options. I’ve had my eye on South Boulder Creek after some interesting visits in September and October of 2012, but the stream flows have been hovering over 200 cfs and that is relatively high for a fairly small streambed. I did notice that the flows dropped below 200 cfs to 193 a few days prior to our planned fishing venture, so I gambled this would be manageable. 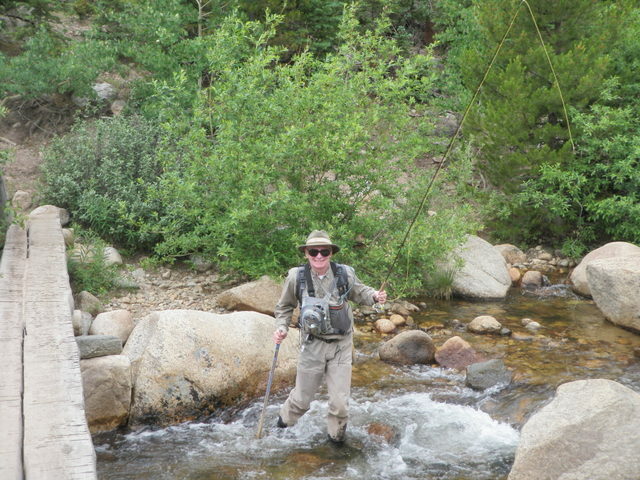 I felt we could do better than Clear Creek and Bear Creek on Dan’s sole fishing trip of 2013, and the Big Thompson is crowded, and the NF of the St. Vrain flows dropped precipitously thus projecting difficult fishing in my thought process. Dan and I departed from Stapleton by 8:00AM and we did encounter a bit of morning rush hour congestion on interstate 70, but despite this hardship, we arrived at the parking lot near the dam by 9:15. The air temperature remained quite cool with quite a few large gray clouds overhead as we set up our rods and put on our waders. We packed our lunches and raincoats as I told Dan I wanted to hike quite a distance downstream on the trail. We followed the trail all the way to its farthest point and at that location we entered the water. The sky remained overcast and Dan began with a Chernobyl ant and beadhead hares ear, and I elected to tie on a yellow Letort hopper and a beadhead bright green caddis pupa and below that a zebra midge larva as a third fly. This proved to be a mistake as I worked the right bank which required backhand casts. Backhand casts and three flies are a recipe for disaster, and I spent much of the first hour of fishing untangling some massive snarls. Dan meanwhile was working up the left bank in expert fashion, and he landed a pair of browns on the trailing hares ear. The midge larva wasn’t producing so I replaced it with a beadhead pheasant tail, and it was this combination that produced my first fish of the day. I cast the hopper along the edge of a current seam and as it drifted back toward me the top fly paused so I set the hook and lifted my rod. Amazingly I saw two fish on my line; one on the caddis and one on the pheasant tail. The top fish freed itself fairly early in the fight allowing me to easily land the small nine inch brown that was fooled by the pheasant tail. Although it was nice to register my first fish of the day, this was probably an unfortunate incident for my long term fishing success. The double gave me incentive to continue the three fly experiment, and that proved to be a major strategic error. Rather than connecting with multiple fish, I found myself unraveling three or four massive line snarls where I had to cut off the trailing flies and then reattach. Eventually I wised up and removed the third fly and fished the hopper and caddis until we broke for lunch at noon. As Dan and I sat on a decaying log consuming our lunches we heard distant thunder, but since we had our raincoats, we didn’t give it much attention. After lunch I experienced a couple refusals to the yellow hopper, so I decided to make a change. Perhaps the fish were attracted by the yellow, but my fly was too large. Clearly they were looking toward the surface for their meal, so I tied on a yellow sally size 14. This proved to be a stroke of solid reasoning and within the first hour after lunch I landed another three fish and in fact I was convinced enough by the effectiveness of the yellow sally that I exited the stream and walked back across from Dan and informed him. Unfortunately he did not have any yellow sallies in his fly box so he waited until we could meet on the same side of the stream. I returned to my point of exit as some large but well spaced raindrops began to descend from the sky. Dan and I both extracted our raincoats and prepared for the worst. Just above my reentry point there was a jumble of dead logs that created a natural dam along the right side of the stream and a fine twenty foot long pool. I dried and fluffed my yellow sally and flicked it five feet above the stick jam and almost as soon as the fly touched the water it was savagely accosted by a fish. I set the hook and watched a twelve inch rainbow leap from the water. This would turn out to be my best fish of the day. Shortly after photographing and releasing the rainbow the storm moved over Dan and I and the interval between lightning flashes and thunder shrank to four seconds so Dan and I found locations next to large rocks and laid low for a bit. Once the thunder and lightning faded into the distance the rain intensified, but we resumed fishing. It was very difficult to keep my dry fly dry as there was moisture everywhere; dense raindrops descending from the sky, wet fingertips, no dry article of clothing to absorb moisture and of course the surface of the stream. The rain continued to descend in sheets as Dan and I worked upstream, but the fish weren’t cooperating and we were getting wet and chilled so we decided to hit the trail and work our way back toward the car with the thought of fishing some nice pools closer to the parking lot should the rain end or diminish. The act of hiking on the path had the effect of warming our bodies somewhat, and we did stop briefly to fish a nice pool just upstream of the footbridge, but it was 3PM and our thoughts turned to dry clothes and the Cannonball Creek brewpub in Golden. It was a fun day before the storm hit, although I wish I’d discovered the success of the yellow sally earlier. 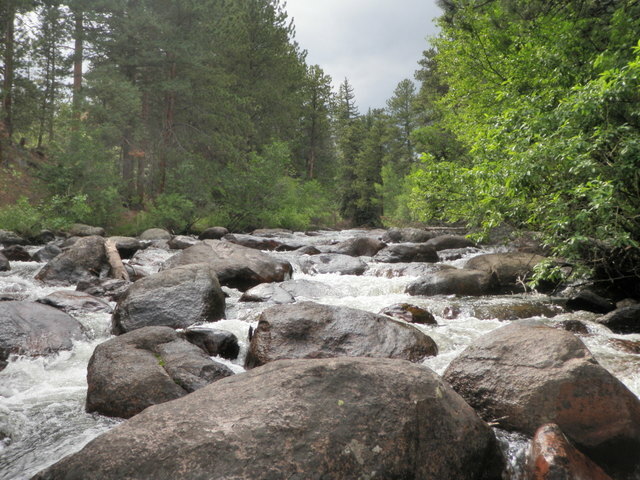 Should the flows decrease to the 150 cfs range, I will surely return to South Boulder Creek. I was either in a fishing slump or I reached the turning point where I shift my focus from freestone rivers to tailwaters and high elevation headwaters. 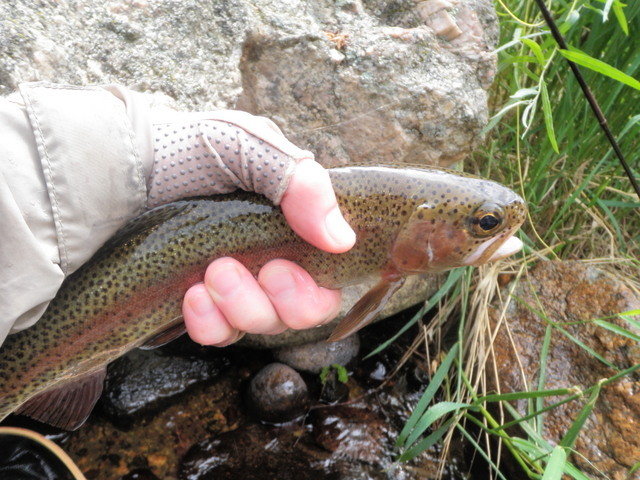 My last day on the Eagle River yielded six fish, a day in Rocky Mountain National Park on headwaters resulted in four fish, and a day on the Colorado River netted five fish. Size was another matter. A few of the Eagle River fish were decent size, but most of the other fish were below average in size for those rivers. 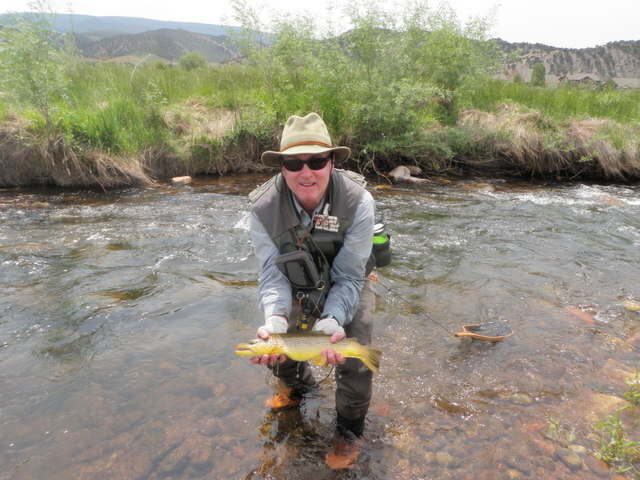 Thursday on the Big Thompson was a slight improvement from a numbers perspective, but size continued to be lacking. 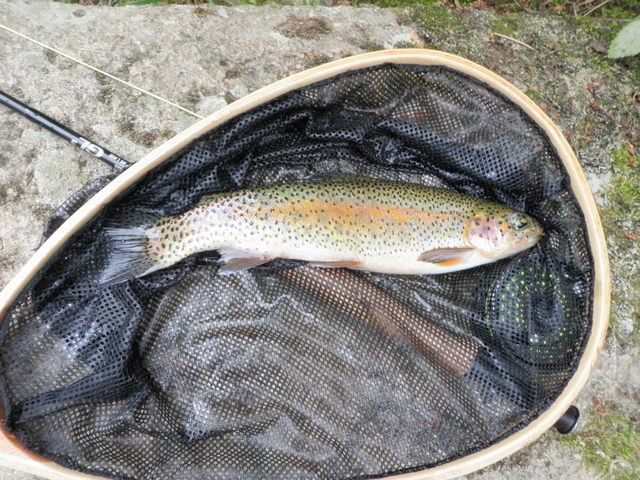 Catching five trout on my newly designed parachute green drake was a nice boost, but given the overcast conditions, I was dissatisfied with the results. 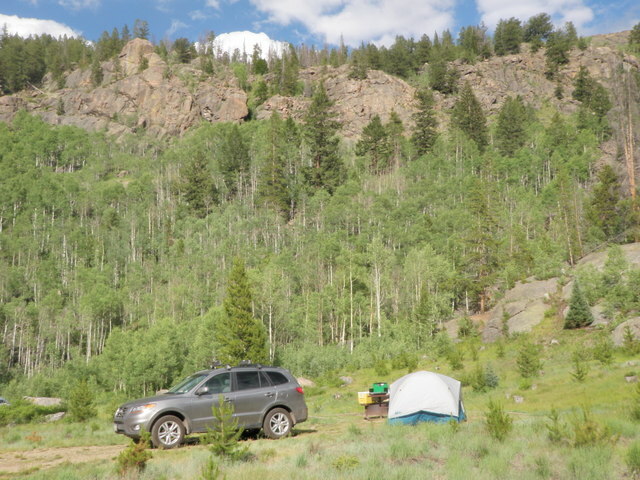 Our original plan for the weekend was to drive to the Denver Creek Campground along Willow Creek north of Granby where Jane and I would set up camp and then spend Saturday hiking and biking and then we would return early on Sunday to beat the construction traffic east of Idaho Springs. While I was at the Saddleback Design Golf Tournament on Friday afternoon, however, Jane and Judy Supple worked out a change in plans. Jane returned the camping gear to its storage locations as we now planned to drive to Steamboat Springs and stay with our friends, Judy and Steve Supple. 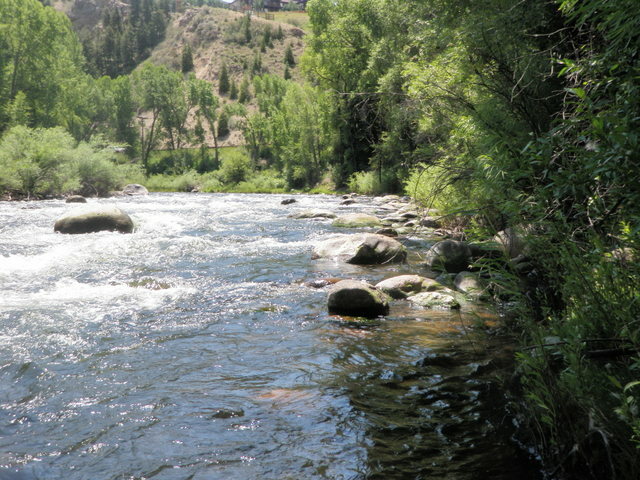 Judy and Jane planned to attend a parade of homes type tour on Saturday morning and then bike around town while Steve and I would fish in the Yampa River. I hate these changes in plans that add to my fishing time. I got home from the golf outing by 6PM and in a short amount of time I packed a few remaining items and we headed off to Chipotle Mexican Grill for a quick dinner. We made the three hour journey to Steamboat Springs and arrived at the Supple condo by 10PM. After some brief chatting we crashed to the sound of hummingbirds hovering by the Supple feeder. On Saturday morning we woke up early to the sound of Grady and Duffy’s tails banging the hallway walls. Grady and Duffy are the Supple’s well loved golden retrievers, and they bring a lot of energy to each day. Judy prepared some quick eggs for breakfast and Steve and I pooled our gear in Steve’s car and headed to the Yampa River below Stagecoach Reservoir. Along the way we passed a pack of road bikers apparently doing a century ride or some distance between 25 and 100 miles. 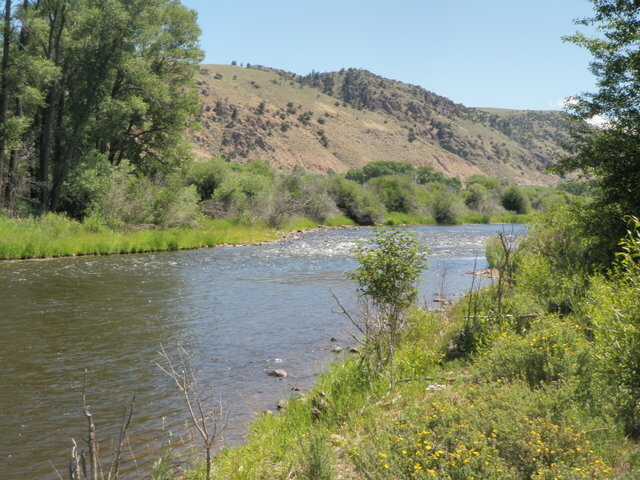 The Yampa tailwater below Stagecoach is a short but impressive fishery with only perhaps .5 mile of open water, but an extremely dense population of fish. I counted 14 fishermen already in the visible stretch of river as we drove up to the parking lot and at least 12 cars in the lot. It would not be a day of solitary reflection. Steve and I quickly set up our rods and climbed into our waders and then hiked down the path to some open water above the last group of fishermen. The positive to this fishery is that the fish density is so great that one does not need a large amount of space to wade in. I chose a spot below Steve and 20 yards above the next downstream fisherman as my starting point and tied on a Chernobyl ant and a beadhead hares ear and then a zebra midge as a third fly below the hares ear. Steve told me the Steamboat Angler was recommending tiny flies such as midge larva and RS2’s. I stood next to and slightly above a large exposed rock with a rounded top and as I began to flick upstream casts I observed one, then two then five then seven or eight large fish in a 25 square foot area next to and above me. I can attest to the fact that this immediately gets the juices flowing. It didn’t take long before the Chernobyl dipped and I set the hook and landed a fine chunky 13 inch rainbow. I gazed out a bit further to a nice run next to another large rock, and there I spotted another nice fish, and eventually another rainbow rose and smashed the Chernobyl. This fly was supposed to simply serve as an indicator for shallow nymphing! Eventually I worked my way across the river to a nice pool area along the opposite bank and here I added a third rainbow that stopped the Chernobyl indicator and inhaled the midge. In an hour or so of fishing I’d landed three beautiful rainbows in the 13 -15 inch range and I was feeling pretty good about this bonus day of fishing. The hares ear wasn’t producing so I exchanged it for an orange scud but kept the midge larva as the bottom fly, and it was this combination that delivered the third fish. After focusing on the pod of fish above me for quite awhile I moved upstream on the left side and over the next couple hours added a couple more rainbows and one twelve inch brown. 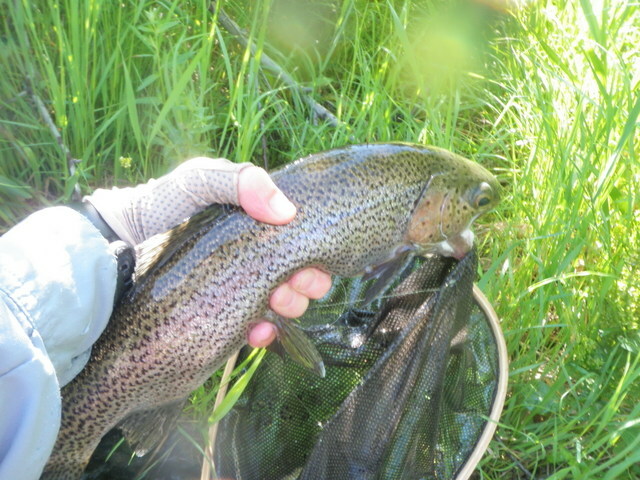 The rainbows crushed the Chernobyl ant and the brown fell for an olive midge larva that replaced the zebra midge. I was amazed by the success of the large Chernobyl with the bright peacock chenille body in a river where miniscule flies are recommended. There were probably 50-100 casts in between each catch and most fish ignored my offerings, but enough fish were gullible enough to show interest in my flies to make things interesting. 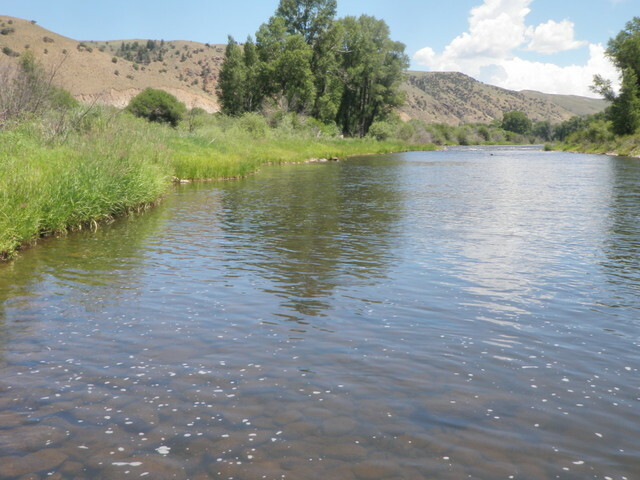 By one o’clock I found myself positioned below a nice pool characterized by a run that ran within four feet of the left bank and then a much stronger current that bordered the right side and split the river in half. I could see ten to fifteen large trout spaced out in this pool between the currents and they weren’t showing interest in my three fly offering so I decided to experiment with single dry flies to see if I could unlock the code and land one of these beauties. I was at seven fish and they were all nice size so I was ready to do some focused dry fly fishing for the remainder of the outing. First I tried a parachute ant and one large fish nosed this fly at least three times. I could actually see the wave created by the fish’s jaw spill over the ant on one of the close up looks. Next I tied on a size 18 light yellow comparadun, but this didn’t even create interest when it passed over the fish. I’d spotted a few sporadic PMD’s riding the surface of the water and a couple that became airborne, so I elected to tie on a light gray size 16 comparadun. I cast this fly to the very top of the smooth water and as it drifted slowly back toward me a large rainbow gradually elevated under the fly, inspected, and then miraculousloy sipped it in. I made a quick sure hook set and battled the big guy to the net. This fish was easily 18 inches with a nice thick girth, but I couldn’t settle it on my net for a photo and eventually it squirmed back in the water and snapped off my fly before I could capture a good photograph. I tied on another light gray comparadun and flcked it upstream but slightly below the point where I’d hooked the previous fish. This time the fly drifted to the midsection of the pool area and it was deja vu. Another rainbow slowly floated back under the comparadun and then confidently sipped it in. Again I reacted with a solid hook set and played and landed a sixteen inch rainbow. This was really fun. I decided to leave the spot I was in and walk downstream to find Steve and offer him a light gray comparadun. It was now 1:45PM and we planned to depart at 2PM and the crowd of fishermen had thinned out significantly. I found Steve in a prime pool closer to the parking lot, a spot that was ringed with fishermen when we arrived in the morning. I gave him a comparadun and then began probing the nice water near him. There was a little nook next to the bank where a side current curved along the bank and then merged back into the main current. I could see at least eight nice fish in this small area and I succeeded in getting one that was inches from the bank to refuse my fly two or three times. There were a couple nice rainbows in the slack area between the current along the bank and some large rocks at the top of the indentation. I couldn’t get a good drag free drift over these fish because of the swirling current even though I moved several times to create different approach angles. I gave up on this area because of the difficult angles and moved close to Steve. Steve pointed out all the fish that were stacked up below him ostensibly to feed on nymphs and larva kicked loose from Steve’s wading. I attempted a few downstream drifts to these fish, but they were looking down for their meal and probably aware of our presence. I pivoted around and popped some casts into some faster moving runs between exposed rocks above us, and on one of these drifts experienced a refusal. I rested this run for five or six casts to an adjacent run, and then returned to the scene of the refusal and midway down the run a fish rose and slammed the light gray comparadun. This fish betrayed itself as a hot fish as it charged up and down the river in short spirts. Several times I thought I had control and attempted to raise the fish’s nose, only to face another short spurt upstream and then downstream, but eventually it grew weary of the fight and I slid my net under a brightly colored rainbow. It was another 15 inch fish, but this one was perhaps the most fit and brightly colored of all the fish I landed on the Yampa River. Ten fish landed in five hours does not sound that exceptional, but all the fish were in the 13-18 inch range and all but one rainbows. I was able to land three fish on a Chernobyl ant and three on a size 16 light gray comparadun, and by all accounts this is exceptional for this stretch of water where size 20-24 size flies predominate. Just spending five hours fishing over hundreds of large trout that I could see and target was a salve to my bruised confidence after being battered by a heavy dose of unproductive blind casting in the previous four outings. On a bright blue sky day with high temperatures approaching 90 degrees, this day was a huge success and perhaps among my top ten of 2013. After a slow hot day on the Colorado River on Wednesday I had another day available to fish since the office manager didn’t have June ready for my attention so I decided to make a trip to the Big Thompson River below Lake Estes. 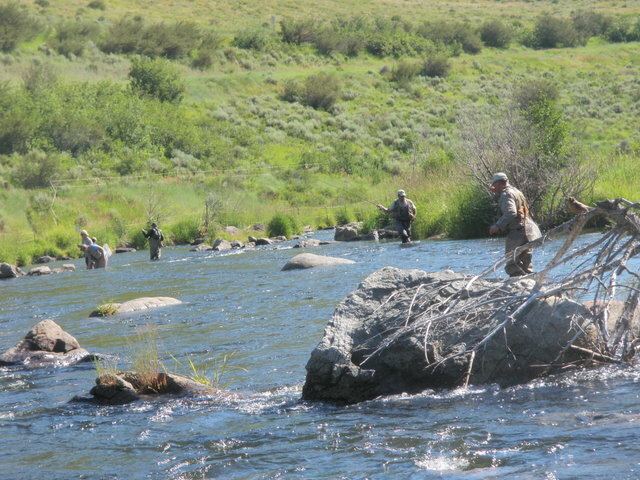 Flows have been at 125 cfs for several months now and fish tend to love consistency. The other option was the North Fork of the St. Vrain, and that was tempting, but I’d been there twice recently and I was looking for something different. I checked out the various fly shop reports on the Big Thompson before I departed at 7:30AM and all suggested that the fishing was reasonably good. I arrived along the stream at around 9AM and parked on the right shoulder just above the RV park at a large bend. Quite a few of the pullouts upstream were already occupied and I continue to be amazed by the pressure this relatively small stream receives. I suspect Rocky Mountain National Park attracts a lot of tourists and they decide to hire a guide for the day and the Big Thompson in the canyon is the best local fishery. It was already quite warm for 9:30AM as I waded into the Big Thompson just above the last RV. As is my custom I began with a Chernobyl ant and a beadhead hares ear and it didn’t take long before I landed an eleven inch brown as I lifted to recast, but then I began noticing refusals to the Chernobyl ant so I clipped off the two fly combo and began experimenting with different dries that the fish might be willing to eat. I tried a light gray caddis and a small stimulator with a green body but this didn’t even prompt refusals. Eventually I went back to the dry/dropper with a yellow Letort hopper and a salvation nymph, and the nymph produced a nine inch rainbow. After an hour of fishing I’d landed two fish, but I was covering a lot of territory in order to land a few fish and the air was getting warmer. I worked my way up along the roadside bank prospecting all the decent pockets and slots and landed another small six inch rainbow on the salvation nymph, but I experienced a long dry spell so I decided to replace the salvation nymph with a bright green caddis pupa under the theory that the reports mentioned caddis and a pupa with some movement might create some interest. Sure enough as I was climbing over some rocks to move upstream I allowed my flies to dangle behind me and a rainbow nailed the caddis. I played it for a bit and could see it was a rainbow when it leaped from the water, but then it turned in some faster water and the fly came free. It was now 11:15 so I decided to return to the car and eat my lunch and exchange my Loomis five weight for my Sage four weight as this is a stiffer rod and better for deep nymphing. After lunch I returned to a nice deep slot and began working the nymphs deep with a lot of movement. You don’t know until you try, and in this case I tried with no results. I grew bored with nymphing and hadn’t the fish at least been looking toward the surface and refusing the Chernobyl ant? I removed all the nymphing gear and returned to a gray parachute hopper with the beadhead hares ear below and returned to popping the dry/dropper into the likely pockets. Sure enough in one nice pocket a rainbow tipped up and confidently slurped the parachute hopper, but the success did not repeat as several refusals ensued. By now the sky was getting dark and some large gray clouds were building to the west and I could hear distant thunder. I didn’t think it would rain much so I ignored the weather for awhile, but then the rain intensified so I waded to shore and pulled my raincoat from my backpack and slid it on under my wader straps. I pondered the success on the parachute hopper and then the refusals and remembered that one of the fishing reports mentioned drakes as a hatch that was present. I’d seen them on the Big Thompson quite a few years ago. Fish have a long memory for green drakes, so could they be mistaking the gray parachute hopper for a green drake? I had nothing to lose so I pulled out one of the brand new parachute green drakes I’d tied this winter and tied it to my line. It looked great with a clump of long moose mane fibers for the tail and a white calf body wing that I colored gray with a marker and left the tip white for visibility. I applied floatant and flicked it upstream in a nice pocket and, wham, it disappeared in a confident swirl. Was this a tease like previous single hit flies? I continued casting the green drake and landed two more rainbows in the process, and I was quite excited by this discovery. Unfortunately the water wasn’t offering many good holding spots so I progressed quite rapidly to an area where another fisherman had just been so I decided to exit, return to the car, and drive to another location. It continued to rain lightly as I drove further east on the highway and stopped at the small pullout just before the dirt road that leads to Grandpa’s Retreat. I jumped out of the car and grabbed my rod and gear and walkded down the dirt road until I spotted an RV parked along the shoulder. I wasn’t sure if this was a fisherman, so I decided to cut down to the water ten yards above the RV. I began casting the green drake but now the thunder grew louder and some flashes of lightning lit up the sky. The wind and rain picked up a bit, but I continued on and two more rainbows rose to the green drake. Unfortunately an increasing number of refusals were also occuring and it seemed I was covered more juicy spots with no reaction. I had now landed nine fish so I focused extra hard to try and net number ten and this led me to an extremely juicy hole just down from the Santa Fe. I flicked the green drake to the foam line in the center of the hole and allowed it to drift right along the current seam to the tail. With my polaroid sunglasses I could see one, then two and then three rainbows rise to within six inches of the fly and then drop back down. I witnessed a triple refusal! 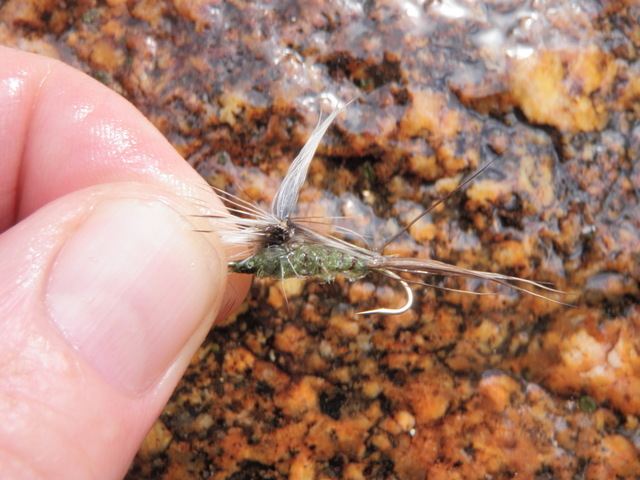 It was clear that these fish were not going to be duped by the green drake so I ran through some fly changes….a light gray caddis, a lime green trude and an ant. They were having none of them and I was beginning to feel a bit chilled and it was approaching 3PM with no sign of let up in the weather so I called it a day and returned to the car. In summary it was a slow day on the Big Thompson, but I at least unlocked the secret to some decent surface action in the afternoon. It was gratifying to see the success created by my parachute green drake invention. I was surprsed that the overcast and light rain didn’t initiate more hatching activity. With Dave Lach, an employee of Air Products and a friend of my fishing buddy Jeff Shafer, spending the coming weekend fishing in Colorado, I decided to make a scouting expedition to the Colorado River to determine whether it was worthwhile for Dave L. to make the detour to Parshall to fish on Saturday on his way to the Frying Pan River. The reports indicated that fishing was four stars with pale morning duns, yellow sallies, and caddis present. I’m somewhat skeptical of these reports since I’ve been burned by them, and the fly shops tend to overhype the conditions to attract customers and they are notoriously shabby in keeping the information current. I made one trip to the Colorado River in 2012, and it was very difficult fishing. In 2011 I visited this stretch of river three times with poor results. 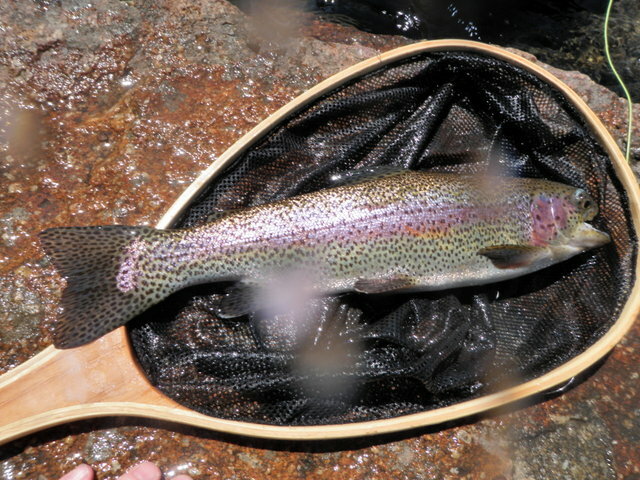 In the three years prior to 2011, however, I experienced some of the best fishing I’ve ever had in Colorado. So what would 2013 be, Jekyll or Hyde? I had everything prepared Tuesday night so that I launched from my house by 6:40 and this enabled me to avoid the morning traffic rush and I was the first car in the parking lot at the Sunset access point by 9AM and I was in the water fishing by 9:30AM. Fortunately I doused myself in insect repellent prior to descending the sagebrush bank to the river where swarms of mosquitoes buzzed my ears with every step through the shrubs and grasses along the river. I decided to head downstream first and walked as far as I could along the north bank and then crossed at the top of an island and began walking down the south side of the island. I spotted another fisherman in the north braid and then another fishermen fishing downstream at the bottom end of the island in the south channel so I tied on a Chernobyl ant and beadhead hares ear and quickly covered the center run at the top of the south braid with no success. When I got to the top of the island I moved to the south bank where there is some nice smooth water in shadows with moderate depth. The north channel fisherman had now moved to the top of the island as well, and he opted to test the nice riffles along the north bank. Ultimately I had my eye on the beautiful long pool just above me, so I was concerned the other guy would usurp my target water. As I began prospecting the ten feet of water out from the bank, I spotted a few sporadic rises, and determined that the dry/dropper wasn’t what they were seeking so I began a game of trial and error with dry flies. I tried a light gray caddis and a light gray comparadun and a parachute ant. There were a bunch of spinners bobbing above the riffles to my left, so I dug in one of my boxes and found a rusty/tan sulfur spinner I’d tied for Pennsylvania and tested it for awhile as well. None of these offerings did the job and I moved up to a point where a gentle current angled toward the bank and then deflected parallell to it. In this area I spotted two fish working, I think, although it may have been one cruiser doing a circular route. I believe, however, that a smaller fish was in the nervous water where the current angled and this fish made two or three splashy rises separated by quite a bit of time. The other fish was a large cruiser that was in the slow water just above the angled current and five feet out from the bank. I know this fish was larger because I could see the back fin and the tail out of the water, and the distance from nose to tail was substantial. Unfortunately I placed all the flies I mentioned including double dries over these fish and they would not respond so after an hour of fishing I moved on with nothing to show for my efforts. I moved on to the previously mentioned long pool as the other fisherman retreated back to the north channel next to the island. The long pool is probably half a football field long and is characterized by a wide riffle at the head that angles toward the south bank and then the main current flows along the bank but there is nice water with decent depth twenty feet out for most of the length of the pool. I elected to wade to the riffle area at the top using the shallow barren north water, and then I decided to tie on a yellow Letort hopper and salvation nymph. The Chernobyl was difficult to see in the sun glare, and the large wing of the hopper was much more visible. I also hoped that the yellow fly might be mistaken for a golden stonefly. All this was good in theory, but it didn’t pan out in my real life application. I fanned casts across the entire width of the riffle where it enters the long pool and deepens and then worked downstream shooting longer casts close to the bank. It was a lot of exercise with only a swirling refusal to the hopper in the eddy seam below an exposed rock to show for the effort. After this thorough coverage of the long pool area I decided to move on to the next juicy pool upstream. This required a hike along the south bank through swarms of mosquitoes, and when I arrived next to the pool I decided to eat my lunch early as it was approximately 11:15AM. After lunch I retraced my steps to the tail of the pool and crossed to the north side and as I did this I spotted some rising fish at the left tail. Having seen the spinners bopping above the riffles, I decided to give the sulfur yellow-rust spinner another try. This turned out to be a prescient move as I landed a pair of thirteen inch browns that smacked the spinner. I was pretty excited to get on the scoreboard, and the fact that they took the spinner was icing on the cake. In additon I experienced a heart stopping swirl, a refusal, in the same area. I paused to seine the river with my net and found a solitary PMD dun so I replaced the spinner with a size 16 light yellow comparadun, and this created another slashing refusal and then I connected on a fish near the bank, but the weight on the rod was only momentary as the fish escaped. Just above the scene of these near misses I could see a nice fish working the deep trough next to the bank. I positioned myself and made quite a few casts above the fish by shooting line high and letting the fly flutter down into the slow current. In spite of my best presentations I could not fool the nce cruising brown. I finally surrendered to the fish at the tail of the pool and moved up to the midsection where I paused to observe for rises, but none were forthcoming. The top third of the pool looked like nymphing water so I added a strike indicator, small split shot and a beadhead hares ear and pheasant tail, and worked my way back down to the middle as I cast the flies to the current seam and the deep water along the edge of the riffles. I began noticing quite a few yellow sallies buzzing through the air, and then spotted two random rises so I gave up on the nymphs and went back to a fresh never before used yellow sally. I cast the yellow sally to the places where I’d seen a rise, but nothing was doing. Having now covered the entire pool from top to bottom I elected to hike back to where I began the day. I was above the island and below the long pool and I began to cast to the area where I’d spotted a large brown working in the morning. The yellow sally wasn’t attracting any attention but I spotted another single PMD dun, so I exchanged them, and the PMD also failed to bring any fish to the surface. I pondered my next move and decided to add a parachute ant with an orange wing post as my second dry fly, and similar to the Eagle River, a large fish made my heart stop when it put its nose against the ant but refused to sip it. I made a few more casts, and then switched the fat bump ant for a skinny version. After some more drifts a ten inch brown aggressively attacked the PMD and I had my third fish on the day. Having disturbed the area on the south bank I turned my attention to the nice long run along the north bank. and here I landed two small browns on the skinny ant. After I’d fished the north bank I waded back to the top of the long pool and observed the area for quite a while hoping a fish would give itself away. I was particularly focused on the nice deep run along the south bank, but nothing cooperated so I quit at 4PM and battled through the mosquitoes to the parking lot and escaped to make my two plus hour drive back to Denver. Having experienced the worst fishing ever on Roaring River, Jane and I packed up our gear and hiked down the Lawn Lake trail to the car and proceeded to drive to the Moraine Park area. Some dark clouds had moved in from the west and the sky was becoming threatening so we made sure we had our raincoats as we began hiking the trail along the Big Thompson River. We continued under the Bear Lake Road bridge and followed the path for a ways until we hit a wide path that led to a pedestrian bridge over the river. Jane set up her hammock between some trees on the other side of the river and I waded in to a nice spot just above the bridge. I went back to my Chernobyl ant and salvation nymph and began prospecting the slack water along the side of the main run hoping I could induce a strike while Jane watched from the bridge, but I wasn’t so lucky. I moved up along the right bank and found a nice spot with a deep narrow slot about three fourths of the way across the river. I began casting high in the smooth water between faster currents and saw the foam ant dip and reacted with a hook set. Sure enough I felt momentary weight and spotted a fish flashing near the surface, but the weight disappeared in an instant. I cast again and higher in the three foot slick area the same scenario repeated, and I was even more frustrated with my inability to land a fish. From this point until 5:30 I worked upstream and fished from small pocket to small pocket. The entire width of the river was 100% pocket water and I popped casts into each one that appeared deep enough and long enough to hold fish. This method of fishing involves short casts, keeping the rod high and the line off the water, and very short drifts before drag takes over. The other main accompaniment to pocket fishing is rock climbing. I carefully moved from boulder to boulder until I was in position to peer over the rim of the next upstream rocks into another pocket. The Chernobyl and salvation nymph were not producing so I tried some caddis, but these also didn’t bring any action to my rod, so I eventually tied on a lime green trude. This fly elicited some refusals but also accounted for the three small fish I landed during the remaining time I fished. Two were six inch browns and one was a 6-7 inch rainbow. Some dark clouds moved in and it began to rain, but not enough to make my fishing shirt totally wet so I fished on. But then I heard some thunder and saw some lightning and I heard a voice on the bank and it was Jane coming to be my better judgment and reeling me in from a poor fishing experience. I fished a couple attractive small pools as she looked on and almost fell in when my foot got wedged between two rocks. I did land the third small brown while she observed and then retreated to the bank and walked with Jane back to the car. It was a rather frustrating fishing day in Rocky Mountain National Park, but the scenery was spectacular and I had the companionship of my lovely wife and I purchased a $10 lifetime admittance to all national parks so it was still a pretty good day in Colorado. After a slow day on the Eagle River on Wednesday, I was excited to fish a smaller headwater stream that didn’t have fussy brown trout. Jane and I talked and decided to drive to Rocky Mountain National Park and hike up the Lawn Lake trail to fish the Roaring River. Well at least I would fish the Roaring River and Jane would enjoy the scenery and take her Kindle and hammock and find a peaceful place in the beautiful outdoors. 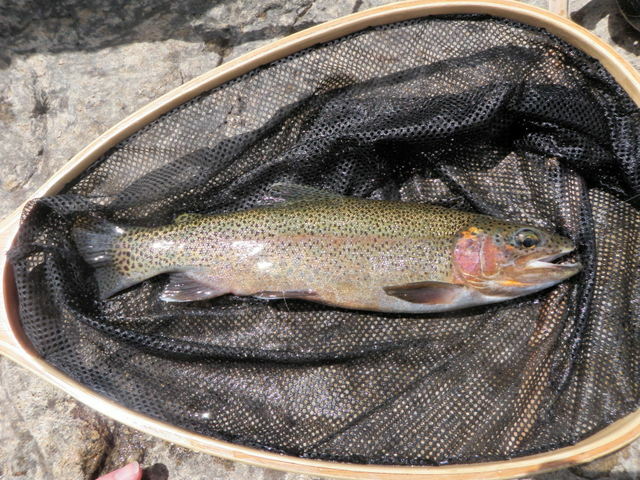 The Roaring River is in the northern part of Rocky Mountain National Park and holds 100% greenback cutthroat trout. 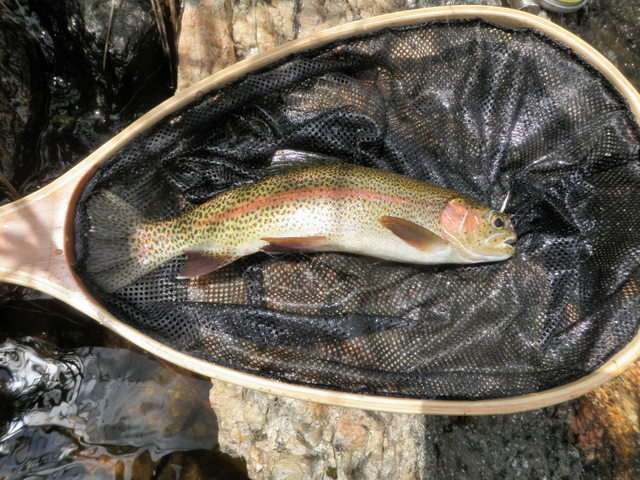 These fish are colorful little gems and while not that big, I’ve enjoyed some fabulous days fishing the Roaring River. Generally I visit this stream in early July so I was quite optimistic that I’d catch a bunch of greenbacks. We got off to somewhat of a late start and arrived in the park by around 10:30AM. The highlight of the day was discovering at the park entrance that I qualified for a senior pass for $10 because I am 62 years old. This pass entitles me to unlimited admission to all U.S. national parks and national monuments and national recreation areas for the rest of my life. It also entitles me to a 50% discount on national forest campgrounds and this is a feature that I will use quite a bit. Jane and I parked at the second lot that services the Lawn Lake trailhead and began our ascent of the steep trail that leads to Roaring River. We took the trail branch that leads to Ypsilon Lake and then turned right just before the one log bridge and found a base area to stash our backpacks and equipment. I quickly got into my waders and assembled my rod and began fishing for a half hour. I started with a Chernobyl ant and trailed a salvation nymph, but this yielded no results. I exchanged the salvation nymph for a beadhead hares ear and once more I was shutout from landing any fish. Not only was I not catching fish, I also wasn’t observing refusals or even spooked fish. I decided to take a lunch break at 12:30 and returned to our base camp where Jane was surprised to see me. After lunch I walked back to my exit point and continued fishing upstream quickly prospecting all the likely spots where trout might hold. I decided to switch flies and tied on a bushy small stimulator with a green body and this may have provoked one refusal. I added a pheasant tail below the stimulator and still had no success. I downsized the stimulator to a light gray caddis and that failed to produce as well. Eventually I tied on a size 14 lime green trude and landed my first and only eight inch greenback and quickly took a photo as I was sensing this would be my only chance. By two o’clock I’d covered quite a bit of water with only the single greenback and a few more refusals to the trude to show for my efforts. I was getting further away from Jane and the fishing didn’t seem to be improving so I decided to rush back to base camp before Jane set out on a hike to Ypsilon Lake. When I arrived she in fact was getting out of her hammock and preparing to hike, but she agreed to pack everything up and head back to the trailhead to move to another stream within RMNP. Where are all the greenback cutthroats in Roaring River? If I had seen more fish but was unable to catch them, I’d be less concerned, but I clearly was not spotting the number of trout that I did in my many previous visits to this stream. After experiencing an hour and a half of intense pocket fishing on Tuesday and then a nice hatch in the early afternoon, I was convinced that another interesting day of fishing on the Eagle River was in store on Wednesday so I returned to Hornsilver and snagged campsite number one for a second consecutive night. Aside from some rock climbing revelers that were partying at 1:30AM, the night was relatively uneventful, and I awoke to a moderately warmer morning. There was quite a bit of dew on my two person tent and I didn’t want to wait for it to dry, so I rolled up the tent and rain fly and stashed them in the back of the Santa Fe. Once again I ate my breakfast, prepared a sandwich for lunch and packed everything in the Santa Fe and drove for half an hour to the Edwards rest area. My plan for Wednesday was to return to the water above the pedestrian bridge and cover sections that Dave G. and I visited on Friday. I wanted to save the pockets along the right bank above the pedestrian bridge that Dave G. covered on Friday for the prime time, 10:30AM until 2:00PM. With this strategy in mind I walked along the left bank above the bridge and around the 90 degree bend to the spot where the currents merge below the island. I tied on a Chernobyl ant, beadhead hares ear, and beadhead bright green caddis pupa with the hope of repeating my morning success of the previous day. The angled riffles and run below the island did not produce any fish and as I moved into the smaller left channel it was obvious that the river flows had dropped significantly since the previous Friday. Deep runs had become shallow riffles and there were only three or four small deeper pools that might contain fish. I did manage to hook and land a small ten inch brown half way up the left channel. At the top of the island the same lower stream level manifested itself, but this actually made wading easier and in the main channel of the river offered more obvious holding lies for fish. I was optimistic that I could take advantage of this and pop my three fly combination to the juicy pockets and deeper runs and land some nice fish. Unfortunately it didn’t develop that way. I covered the entire left bank above the island until I reached the point where a tiny branch of the river split off and ran back toward the top of the island with nothing to show for my enthusiasm and effort. I was astounded at my lack of action and also concerned about my prospects for the remainder of the day. In addition by 10:30AM it was already quite warm with very few clouds in the sky. I used the small branch of the river as my escape route and waded back down to the island and then retreated back around the bend to the pedestrian bridge and crossed to the opposite side. It was now close to 11AM and I was positioned to fish the right bank pocket water during prime time just as I had planned. Between 11AM and 2PM I covered all the juicy pockets with initially the Chernobyl, hares ear, and caddis pupa. After not scoring any fish in the first couple of historically productive runs and pockets, I swapped the Chernobyl for a yellow Letort hopper since that worked in the past and I hoped it would mimic a golden stonefly. Over the three hour period I managed to land four browns and several were in the 14-15 inch range, but it was very slow compared to my experience in previous years and also relative to the morning session in the pockets further down river above the highway bridge. 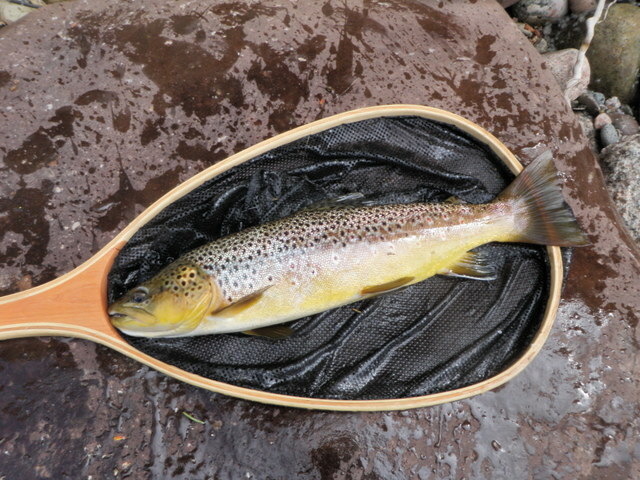 When the hatch began at around noon, I exchanged the caddis for a beadhead pheasant tail and salvation nymph, but this didn’t seem to make a big difference. I did experience quite a few refusals to the hopper and had at least three foul hooked trout. This resulted from me seeing a swirl and setting the hook only to embed one of the trailing nymphs into the body of the interested fish. At least twice the victim trout shot into the fast white water and I let it run until it was below me and then in an effort to skip it back across the surface, the flies broke off. 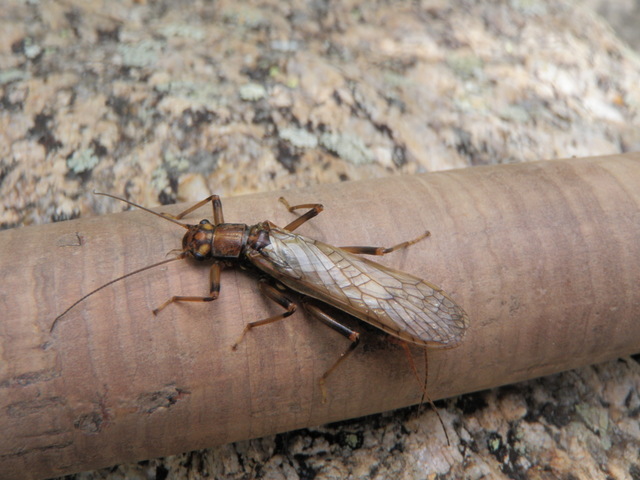 By the time I reached the 90 degree bend at the top of the pocket water, small cream colored mayflies continued to emerge and caddis of varying sizes dapped the stream surface. In a wide riffle just above the bend I spotted a few rises even though the mayfly hatch was waning so I switched to a light gray deer hair caddis and shot a cast above the spot where a rise had been seen. Much to my surprise a fish gulped my fly and I set the hook and the brown instantly leaped and cleared its entire body above the water. It appeared to be in the 13-15 inch range but my hook released as the fish crashed back into the river. This renewed my enthusiasm so I continued prospecting the caddis to the head of the riffles with no additional success as the mayfly hatch disappeared and the caddis continued their surface dance. At the head of the riffles I climbed up the bank to route 6 and hiked back through the condos and returned to the parking lot at the rest area. I decided to return to the spot near the parking lot where I’d spotted two browns on Tuesday afternoon after lunch, and sure enough after I arrived and observed for a bit, I spotted the upper fish doing its thing a foot below the surface and occasionally sliding from side to side to pick off something subsurface. I was unable to spot the lower brown so I focused on the upper fish. It was quite warm and the PMD hatch had ended so I decided to work this fish for awhile to see if I could find something to its liking. I began with the caddis and on the fourth or fifth drift it rose and sipped my fly! I made a quick firm hook set and made contact for a split second, but then the brown slipped off. This was cruel luck for the fisherman. Would the big guy feed again? I rested the water and after a short time the brown began to exhibit its feeding actions by resuming its side to side movement. Over the next half hour I went through a host of flies; a yellow sally (because I noticed a few), a Chernobyl ant (the fish moved slightly to it the previous day), a lime green trude (small golden stonefly imitation), a yellow Letort hopper (larger golden stonefly imitation), and none were to the liking of the visible brown. Finally I spotted a parachute ant in my patch so I decided to give it a try. This particular ant had fairly large bumps and an orange wing post. Much to my surprise the brown rose and put its nose against the ant, but it did not close the deal. My heart stopped and then I dropped into a state of frustration. I opened my foam patch and noticed I had a second parachute ant with a narrower body and a yellow poly wing post and it was the only other parachute ant in my patch. In a last ditch effort to entice the brown, I tied it on my line and flicked it above the brown. On the third drift the brown slowly swam to the surface and sipped it in! 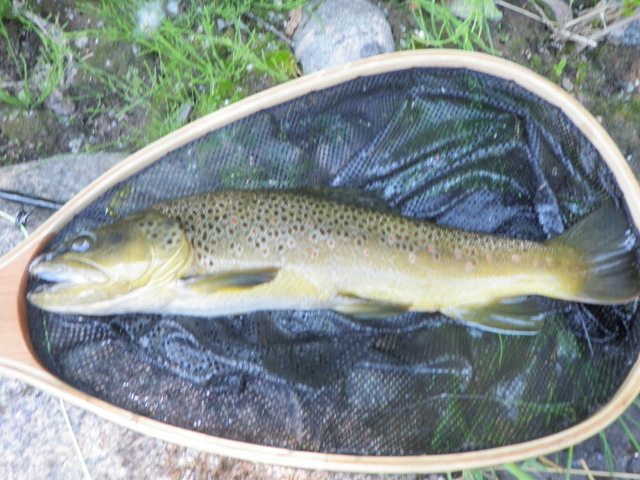 My opponent fought valiantly but eventually I slid the net underneath and had a 15 inch brown. I congratulated my adversary for being a noble foe, snapped a photo and revived him or her in the shallow slow moving water along the bank until it slowly swam back to its holding position. It was a great ending to a somewhat disappointing day on the Eagle River. It was quite chilly when I woke up at 6:30AM on Tuesday despite afternoon highs approaching 90 degrees. The Rocky Mountains are a variable place with wide temperature ranges between day and night. I ate my breakfast and packed a lunch and packed everything back in the Santa Fe as I wasn’t sure I would stay another night. My success or lack thereof on the Eagle River would dictate whether I returned or not. A 30 minute drive down Battle Mountain and through Minturn and then west on I70 delivered me to the Edwards rest area parking lot and by the time I lathered up with sunscreen and put on my waders and rigged my rod it was 9:30. Contrary to the previous Friday, I decided to hike down the river past the Edwards bridge for 30 yards or so and begin my fishing where the river split around a tiny island. I tied on a yellow Letort hopper and copper john and began prospecting likely holding spots. It didn’t take long before I hooked a nine inch brown below a rock at the base of the small narrow island near the north bank. There was a nice deep slot to the right of the island so I repositioned myself to get so nice drag free drifts through this area, and as I was doing this I noticed a nice brown move toward the surface and sip something. There were swarms of small midges on the water so I added a zebra midge below the copper john, and much to my amazement, the indicator dipped and I set the hook and battled a nice brown. Unfortunately after playing the fish for a bit the small zebra midge hook worked itself out of the fish’s mouth. After this disappointment I moved on and fished some nice water between the tip of the tiny island and the bridge and hooked another nice brown on the midge. I know this because I played the fish for a decent amount of time to get a good look at it, but it also shed the small zebra midge larva hook before I could net. At the bridge the flows were too high to wade underneath so I exited and came back down on the upstream side where I made some casts to a small packet right above the cement bridge support. Here I spotted a nice fish, but I couldn’t induce a take. It was about this time that I grew frustrated with the poor flotation of the hopper so I converted my top fly to a Chernobyl ant and also added a beadhead hares ear and jettisoned the copper john and midge. Between the bridge and a fallen tree across from the rest area that is favored by workers as a lunch spot I landed an additional six fish, and this represented the hottest fishing on the Eagle during 2013. It was pocket fishing at its best as I moved back and forth in the wide area of wadeable pocket water between the bank and the fast main current popping casts into the deep pockets and standing ready to set the hook on short drifts with my rod held high to prevent drag. Shortly after moving above the Edwards bridge I added a bright green caddis pupa in addition to the beadhead hares ear and this combination produced the best fish on the day. Only one of the six fish took the bright green caddis but it was a beauty, a 17 inch fish that grabbed the pupa as I began to lift to recast at the tail of a very narrow band of slack water. I was shocked that a fish this large inhabited such a nondescript piece of water on the Eagle River. Several additional fat hot fourteen inch browns were also among the six landed during this one and half hours of enjoyable action which recalled some of my great outings in 2002. After lunch back at the car I resumed the same plan of attack but the game changed as I witnessed an emergence of small PMD’s. In a spot 25 feet above the place where people gather on their lunch break I spotted two very nice brown trout in a four foot deep lane just five feet away from me. Meanwhile some workers arrived below me in the lunch spot, but I didn’t think they were paying much attention to me. 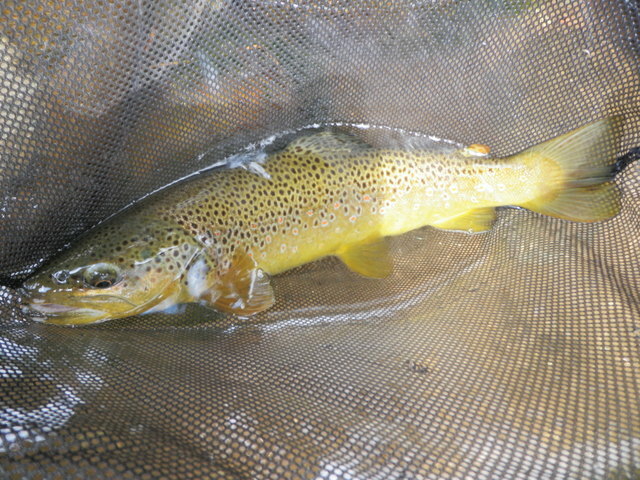 I drifted a Chernobyl over the lower and upper brown trout and both twitched their tails and made a slight move indicating they saw my fly but rejected it. I stopped casting and observed closely and I could determine that both fish were drifting side to side and eating something subsurface. With this insight I changed the bright green caddis for a Craven emerger and then tried lifting to imitate emergence, but this had no impact on the two visible fish. Next I removed the three flies and went with a light gray comparadun hoping this imitated the PMD’s, but again I failed to experience any success. Clearly the two target fish were feeding in the foot or so below the surface, so I went back to the Chernobyl as an indicator and attached a hares ear and pheasant tail on the theory that the pheasant tail mimicked the nymph stage of a PMD. While I was focused on the two difficult browns I spotted another fish rise in another deep lane 15 feet out from me and five feet below. I fired out some longer casts and on the third drift a fish grabbed the pheasant tail and I fought and landed a 14 inch rainbow. Upon releasing the fish I glanced downstream to the group of lunch time workers and one of the men gave me a thumbs up so perhaps they were spectators after all. Once again I turned my attention to the large feeding browns knowing that the pheasant tail had fooled at least one fish. After quite a few casts I actually managed to prick the lower fish as I lifted my flies, so this further added to my frustration, but at least I now learned to go to a pheasant tail nymph earlier in the hatch should I return tomorrow. Having nicked the lower brown I decided to concede to the fish, and I progressed further up the left side of the river all the way to the pedestrian bridge by 3PM and landed another five browns to reach 13 on the day. These fish generally ran smaller than those caught in the morning session although the last one was a feisty 13 incher that consumed the hare’s ear in a nondescript location along the bank just before the bridge. By 3PM the action had slowed considerably as it was quite warm, perhaps high 80’s with a bright overhead sun. I considered returning to the campground and taking a nap, but then remembered that I was curious about the Eagle River between Minturn and interstate 70. 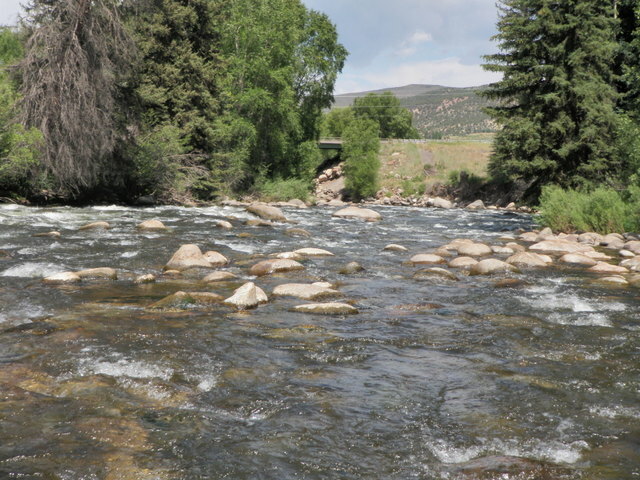 This water is above the confluence with Gore Creek and therefore somewhat smaller and it appeared to have excellent public access along the railroad tracks. Since it was further upstream perhaps it was colder and fished better in the afternoon heat. I decided to give it a try. As I exited I70 and headed toward Minturn, I turned left at the first bridge and parked on the east side of the river. I gathered my rod and hiked down along the railroad tracks to a point just before the I70 bridge and returned to the Chernobyl plus a beadhead hares ear plus a beadhead green caddis pupa. Initially the water was wide with shallow riffles and no holding place for trout so I skipped by until I reached some small pockets tight against the rocks where the main current swept to the east side of the river. Here much to my surprise I landed a twelve inch rainbow and two small browns. Clouds began to build in the west and moved overhead and it began to rain fairly heavily even though the sun was out. Initially I discounted this storm, but quickly realized I was going to get soaked so I went through the annoying process of digging out my raincoat and pulling it on under my backpack and frontpack. Just as the rain began I spotted a rise and quickly clipped off my dry/dropper set up and tied on a dark olive deer hair caddis. This attracted the riser and I landed another small brown. After I zipped on my raincoat I sent a prospecting cast above where I caught the brown and what appeared to be a decent fish rose and sucked in my caddis. I set the hook and felt some weight for a split second, but then the fish escaped. Once the skies cleared I reverted to the Chernobyl and hares ear and was able to add another small brown that consumed the beadhead hares ear to the count. I ended just below the bridge that I parked by in a huge pool and when I departed at 5PM in a tired and weary state there were caddis everywhere but no fish rising. Perhaps there was some great evening dry fly fishing ahead, but I’ll never know. 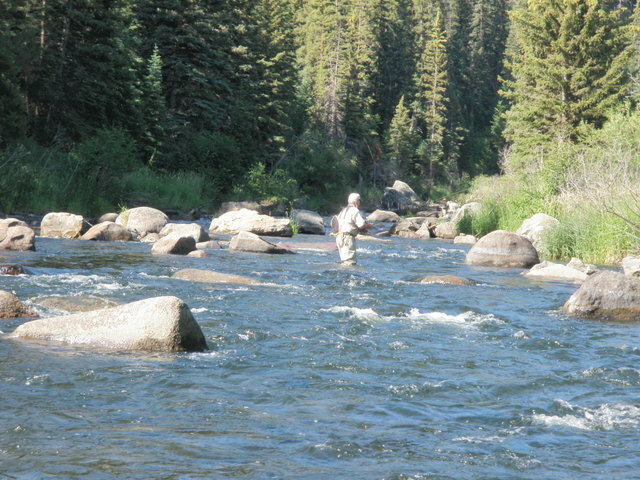 The short taste of fishing on the Eagle River on Friday left me aching for a larger serving, so I decided to make another trip to that area of Colorado on Monday, July 8. I cleared my calendar at work, completed my run, workout and some chores and then packed the Santa Fe with fishing and camping gear. I departed by 3PM and drove west on I70 avoiding any serious delay at the tunnel construction area east of Idaho Springs. My next stop was for fuel in Downieville and the gas station contained a Subway, but a machine was not working at the sandwich shop, so I moved on and exited at Georgetown and purchased a sandwich for my dinner. 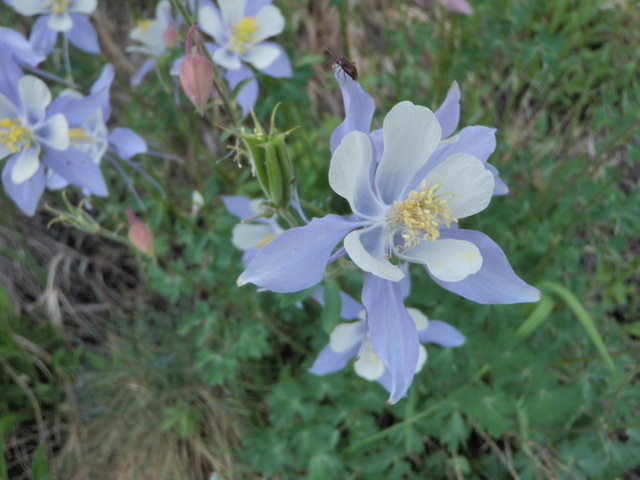 I planned to set up camp at Hornsilver along route 24 south of Minturn and Red Cliff as I have done in the past. This small national forest campground is about as close as one can get to the Eagle River. When I pulled into the small seven site campground there were four sites available so I snagged number one and paid for one night. After setting up the tent and eating a quick Subway sandwich dinner I decided to test the waters on Homestake Creek which is across the street from the campground and is characterized by slow meandering flows and not much structure. In one past visit I drove down the road a mile or two to a stretch with a higher gradient and more typical runs, riffles and pools; and I prefer this type of water so I made the same trip on Monday night. Instead of parking at the top, however, I drove to the bottom and parked on the shoulder of the road just before a large 90 degree bend in the road that continues to Red Cliff. When I crossed the road and surveyed the topography I discovered there was a government facility with no trespassing signs at the bend, so I could not reach the water that way. This forced me to clamber down a steep bank with loose gravel and dirt, and I moved very cautiously by testing each foot placement. Once at the stream however there was a huge pool with large boulders surrounding it on all sides. This would be typical of the first third of the stretch of water I fished on Monday night; plunge pools and steep rock walls creating a small canyon. I tied on a Chernobyl ant and a beadhead hares ear and began prospecting the large pool and landed a nine inch brown after quite a few drifts. 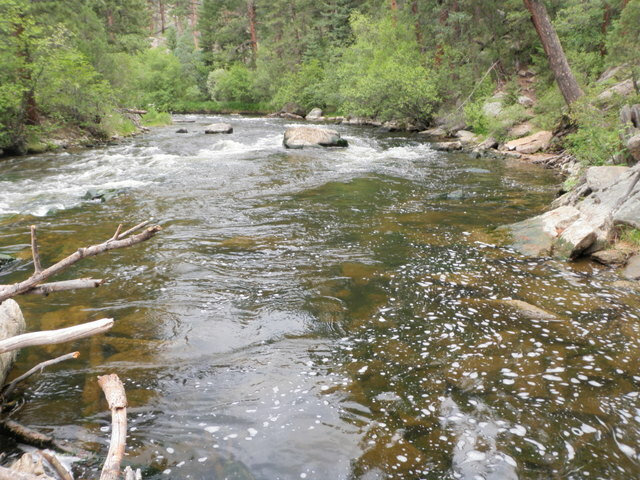 I moved upstream and cast to each plunge pool and landed three or four fish in total in this lower canyon area. It was slow going as I had to plan each move to enable navigating the large rocks and trees along the stream. Eventually I reached a point where a vertical rock wall bordered the stream, and the water was cascading along the base thus preventing me from making further progress. At this point I found an extremely steep relic of a path and carefully negotiated my ascent. When I reached the road and the rim of the canyon I decided to skip the middle section and move directly to the lower gradient upper third. With a fresh start on a new type of water I switched to a royal stimulator and beadhead pheasant tail nymph. By now darkness began to descend, but I managed to land two additional fish on the royal stimulator with a visible white wing and one on the trailing pheasant tail. The flow was higher than I remembered on a prior visit and this seemed to make for slower fishing. On my previous visit I had a lot of success casting to the soft water on the opposite bank and then holding my rod high to eliminate drag. Small browns would grab the trailing nymph as it drifted along the bank. I landed one fish in this manner, but the technique did not produce as well as it had previously. When I reached the top of the higher gradient section where the side road intersected with route 24 I continued uptream a bit to the flats. By this time it was nearly 8:30 and dusk was transitioning into darkness. I observed a nice smooth pool for awhile, but saw no rising fish, so I tried to prospect with a dark olive deer hair caddis, but this proved to be futile and I returned to my campsite and my sleeping bag. 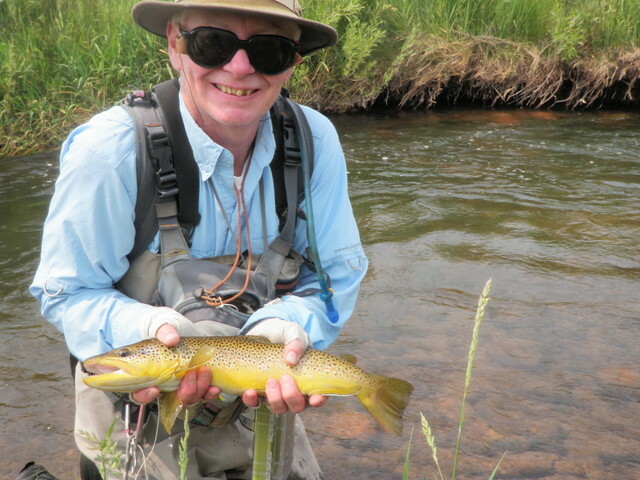 Dave G. called and reserved the stretch of private water for Saturday so we made plans to fish in Brush Creek for a second day, and why not with the excellent results experienced on Friday evening? After breakfast Dave, Beth, Jane and I drove to Sylvan Lake State Park and explored the lake and adjacent campground. Jane and I had never been there so we hiked around the lake and then returned to the Gaboury’s house and grabbed some lunch. 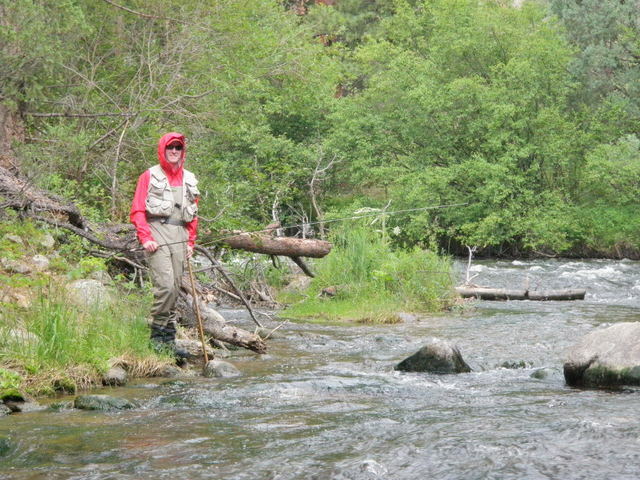 After lunch Dave G. and I put our waders on and geared up to fish the private water of Brush Creek. I took my phone along in a zip lock bag so I could call Jane or Beth for a pick up once we completed our afternoon fishing stint. We began fishing just west of the private water and Dave G. was immediately into several fish. I began with the Chernobyl ant and beadhead hares ear and stayed with this combination the entire two hours we fished in the afternoon except for a brief period when I switched the hares ear for an emerald beadhead caddis pupa. The caddis pupa actually yielded a 14 inch brown, but Dave G. continued to have success with the hares ear so I reverted back to that productive fly. In the two hours we fished in the afternoon I landed 14 brown trout with two rising for the Chernobyl, one hitting the caddis pupa, and the remainder grabbing the trailing hares ear. At one point I was walking through a muddy area on a high bank cautiously planting my feet so I would not slide. It appeared that beavers had been working this area as there were shallow troughs that connected the marshy field to the stream. As I stepped into one of the deeper channels I noticed movement and stared down to discover a trout in the one foot deep puddle. I waited for the muddy water created by my footstep to clear a bit and then was able to see a brown trout in excess of 15 inches. 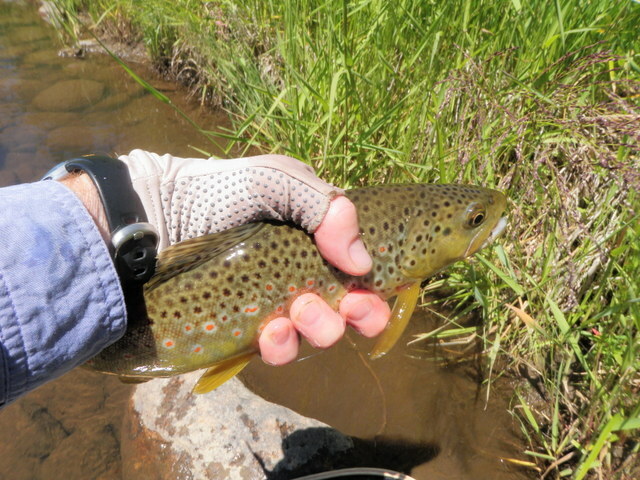 I reached down with my right hand and grabbed the brown and pushed it into my net and then walked to the rim of the high bank and released it into a nice large pool that Dave G. had already fished through. Why was this nice large brown landlocked in a tiny one foot deep trench? My only theory is that it ventured from the stream on a side channel created by beavers when the water was high due to run off and then the stream level dropped quickly leaving my friend landlocked. I felt good about returning this nice fish to Brush Creek and hopefully it will live to be caught and released by other fishermen in the future. The highlight of the afternoon was a 17 inch brown that grabbed the hares ear near the top of a run. The large fish immediately dove and shook its head then made a couple hard but short spurts downstream and back up until I scooped it into my net. Dave G. snapped some nice photos before I gently released the healthy brown back into the cold currents. Just prior to my highlight Dave G. landed a bright yellow 18 inch wild brown, and I was able to record some video and capture some nice fin and grin shots of Dave and his prize catch. When we reached Sylvan Lake Road I called Jane and Beth for taxi service, and we waited only a few minutes before our ride appeared. Once again I took a late afternoon bike ride with Beth and Jane and upon my return, Dave G. and I prepared to fish again. We asked to be dropped off at the very same spot as the morning and covered the same private water and Eagle Ranch public water to the east. I once again began with the Chernobyl ant and hares ear, but after covering two attractive stretches with no results decided to switch to a dark olive deer hair caddis. This was partially prompted by my spotting a nice rise along a juicy deep run. Initially I received a few refusals to the caddis, but then I noticed a couple little yellow sallies fluttering up from the water and added a yellow sally as a second dry fly below the caddis. I moved on and began receiving refusals to the yellow sally, but I stuck with the combination and eventually had a hot streak where I caught four on the caddis in short order. At this point I began to overanalyze. Dave G. switched from dry/dropper to a royal wulff and began to catch fish with regularity. I remembered using a royal stimulator on Brush Creek in the evening with great success, so I clipped off my two flies and tied on a royal stimulator. This brought me nothing but refusals, so I added the caddis that had produced as a second fly behind the stimulator. I somehow managed to catch a small fish on the caddis, but more often than not, the fish were focusing on the royal stimulator that passed over them first and refusing it. I decided to join Dave and sorted through one of my boxes and found a royal wulff and tied it on. Almost immediately I landed a small brown, but this success quickly gave way to refusals. As the daylight waned, I removed my sunglasses and put on my regular lenses and pulled my headlamp on to my head. For some reason I clung to the idea that the royal stimulator would produce in the low light and I returned to it as my only fly. Of course it failed to hook any fish and before long it was 8:30 and we called for our rides and returned home for dinner. I’ll never know if sticking to the subsurface approach would have outproduced the dry flies. 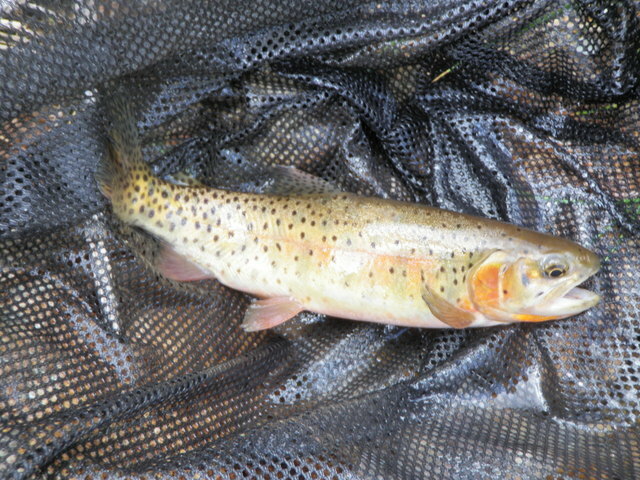 It was still another great day on Brush Creek with 20 total fish landed including several in the 15 to 17 inch range.